The Phlizon Newest 2000w LED grow light is an extremely powerful light with intense brightness. It has a full spectrum as well as low power consumption. 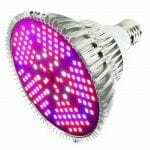 Being an affordable choice, this 2000w LED grow light is popular among many growers. Generally, LED grow lights are an awesome choice for growing cannabis indoor. Meeting the demands of each growing stage, they are safe and energy efficient. Furthermore, they are an affordable replacement for an old fashioned HPS system. 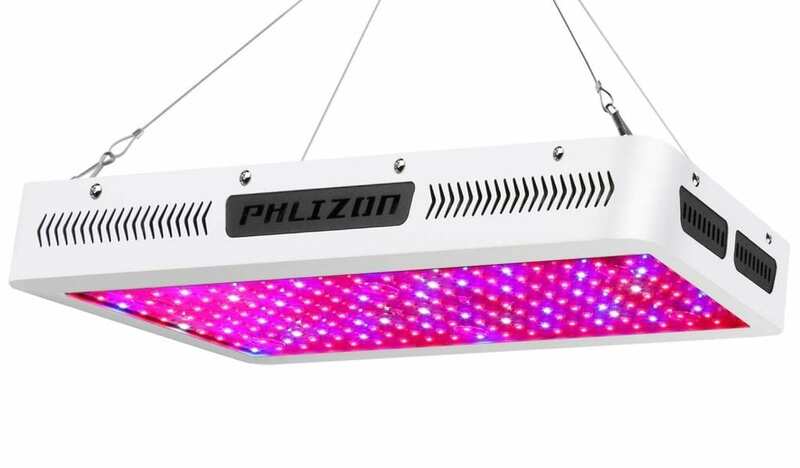 Phlizon has been manufacturing top rated LED grow lights. This brand has gained popularity lately and lots of growers are investing in Phlizon Newest LED grow lights. We also reviewed the Phlizon Newest 600w, Phlizon Newest 900w and Phlizon Newest 1200w. Phlizon 2000 w LED light series brings brightness and efficiency. The double chips provide a full spectrum, which is ideal for the growth of cannabis. Also, its coverage area, lumen, and energy saving capacity are notable features. We’ll get into more detail in the rest of the review. Full spectrum is incorporated in this 2000 watt LED grow light. Phlizon tested this light extensively before putting it on the market. You can expect a comparable light spectrum from the whole newest series but in different intensities and fixture sizes. 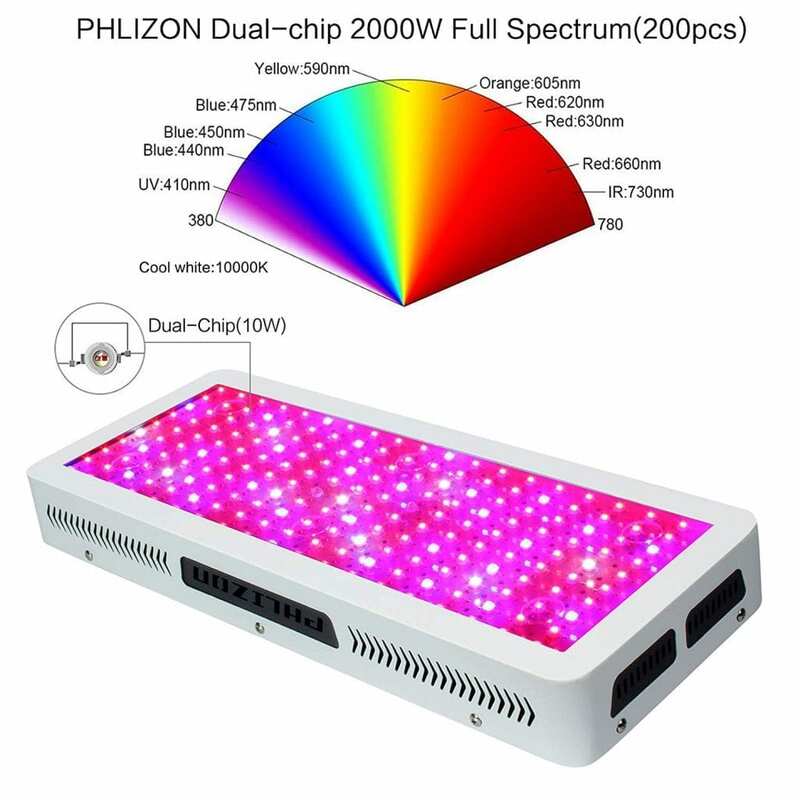 The Phlizon 2000w LED grow light has blue, red, IR, UV, as well as white light. As a result, it makes photosynthesis possible and it optimizes this process. This light mimics all the important wavelengths of natural light. It does so by eliminating all the redundant wavelengths in the spectrum, to save energy. 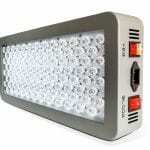 In addition, this 2000 watt LED grow light enhances the process of germination and flowering which enhances yields. The Phlizon Newest 2000w has no reflectors, unlike other LED grow lights. Consequently, this makes the fixture completely heat resistant. 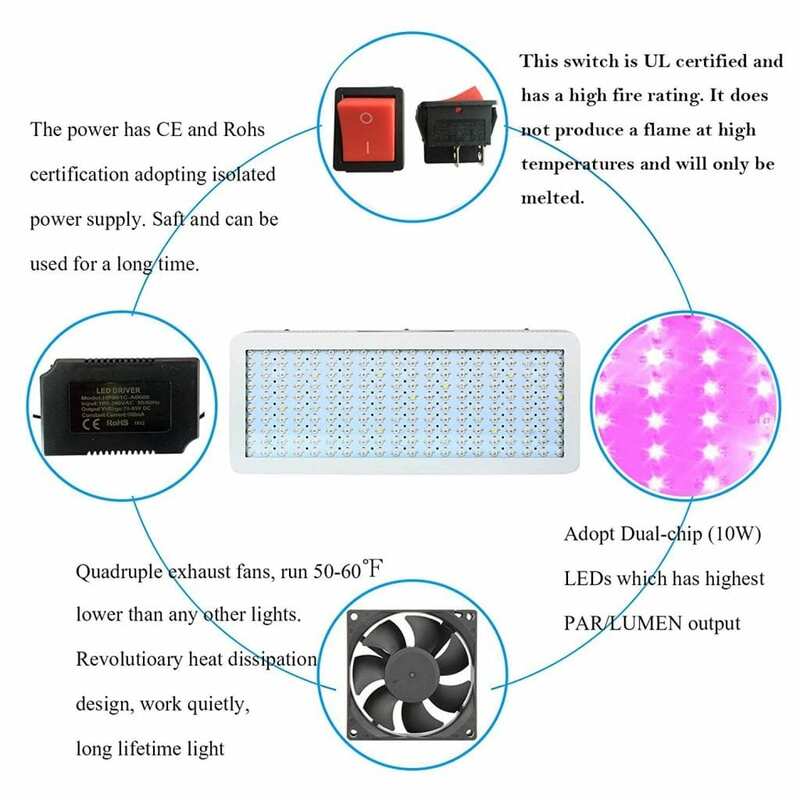 Also, the FCC certification ensures the standardized production of this LED. Moreover, the UL certification of the switch controls for fire danger. The coverage area of this light is 7.2×7.2 feet at a height of 24’’. Maximum coverage of the light is 7.8×7.8 feet, which is good for a 2000w LED grow light. Coverage area is one of the essential factors of any LED grow light. Essentially, it tells you how many plants you can grow with one light. You only need to know how many square feet one plant covers. The dual chip technology gives a great PAR/LUMEN value. It replaces 3w or 5w LEDs that you usually find in LED grow lights in this price range. 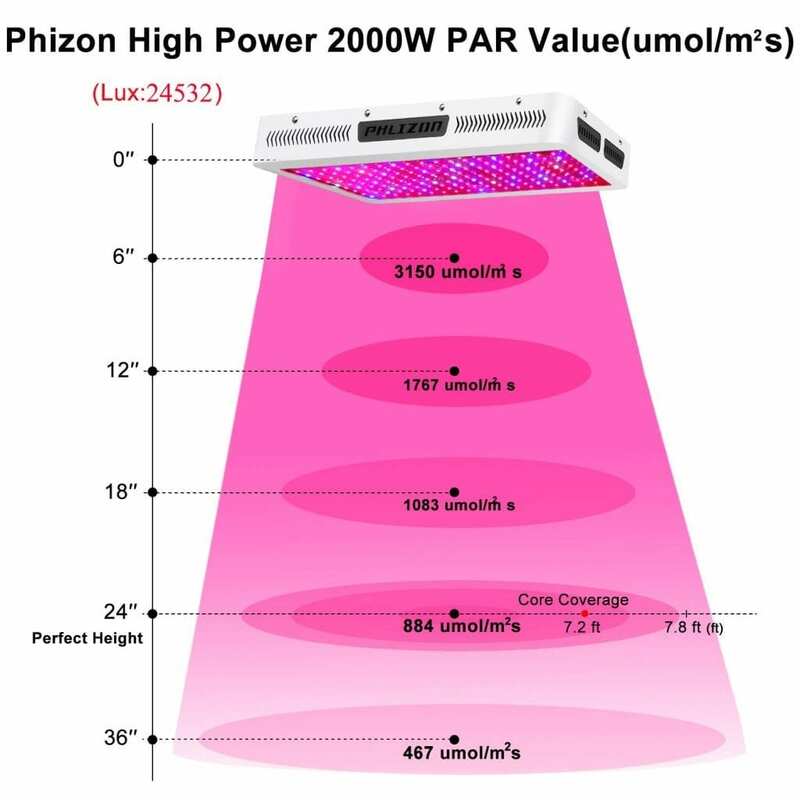 As a result, this Phlizon Newest 2000w can replace a 1600 w HPS/MH while consuming only 308 watts per hour. The light provides a large amount of energy with high intensity. There are not a lot of good videos out there who show you the Phlizon Newest 2000w. We think the 1200w comes pretty close to the 2000w, so you can watch a video review of the Phlizon Newest 1200w to get an idea of the 2000w version in real life. All in all, this is a great 2000 watt LED grow light. It comes with safety certifications and it is ideal for all stages of plant growth. This Phlizon Newest 2000w is definitely worth looking at if you’re looking for an affordable, high power LED grow light. We did however read that this light sometimes fails early on growers. Luckily, there is a two-year warranty included with your purchase. If it does fail early, you can always claim your warranty. We are definitely a fan of the Phlizon Newest series. Hopefully, you liked our Phlizon Newest 2000w review. Make sure to check out the rest of our website as well for reviews on the best growing tools and LED grow lights! Interested in growing tools? Check out our carbon filters, and 4×8 grow tents reviews. 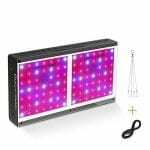 Interested in other LED grow lights? The HLG Quantum Board 550 V2 is really worth taking a look at. Also, COB LEDs are hot right now. Check out the best in our reviews.